Summary: The official wearin’ o’ the green day finds John and Rachael mobile in the middle of the 2nd biggest St. Paddy’s Day parade in the country, right here in dahntahn Pittsburgh! 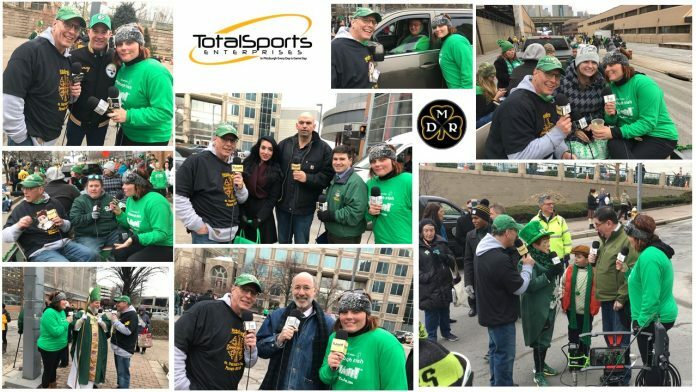 So, we shamrocked and green tinseled a trailer, grabbed some pals and interviewed the finest of Pittsburgh Irish at the annual parade. Catch our mobile chats with St. Patrick from Pittsburgh, the official Peduto leprechaun, Peduto himself, the governor, and Jim Rooney, plus a visit from Femme on our float. Click the play bar below to listen to the podcast. If you don’t see the play bar, above, in your email, CLICK HERE to listen while you work, rest, walk your dog or shovel snow! Next articleBig Announcement! The 3rd Annual #ThingsThatTurnPeopleIntoJagoffs March Madness Tournament Starts Tomorrow!